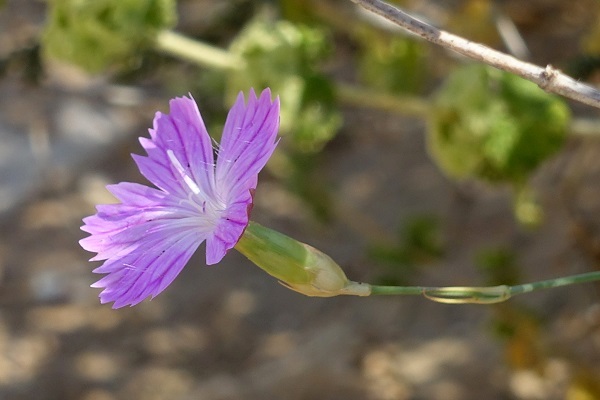 Synonym name: Dianthus polycladus Boiss., Dianthus multipunctatus Ser. 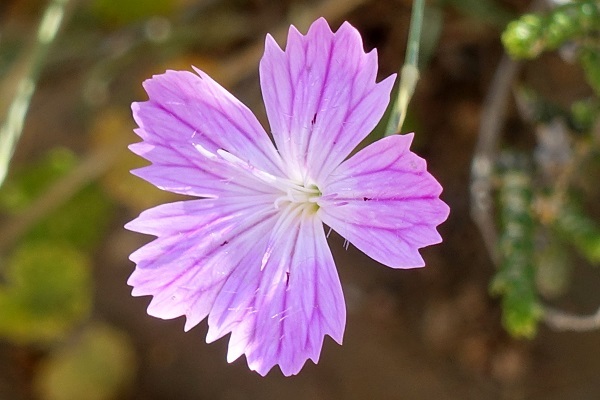 Dianthus, probably alteration of Greek diosanthos, carnation: dios, "god", anthos, "flower", and was cited by the Greek botanist Theophrastus. strictus,drawn close together, very upright, very straight. carnation, from "coronation" or "corone" (flower garlands), as it was one of the flowers used in Greek ceremonial crowns. 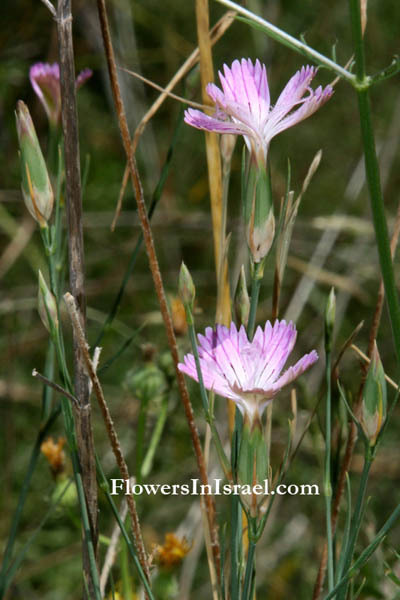 Carnations are thus "The Flowers of God". Carnations were known as "Jove's Flower" in ancient Rome as a tribute to Jupiter, a supreme Roman deity. The standard author abbreviation Banks is used to indicate Carl Linnaeus (1707 – 1778), a Swedish botanist, physician, and zoologist, the father of modern taxonomy. The standard author abbreviation Solander is used to indicate Carl Linnaeus (1707 – 1778), a Swedish botanist, physician, and zoologist, the father of modern taxonomy. The standard author abbreviation Boiss. is used to indicate Carl Linnaeus (1707 – 1778), a Swedish botanist, physician, and zoologist, the father of modern taxonomy. The standard author abbreviation Ser. is used to indicate Carl Linnaeus (1707 – 1778), a Swedish botanist, physician, and zoologist, the father of modern taxonomy. Carnation or pink, especially when red, is a symbol of betrothal. 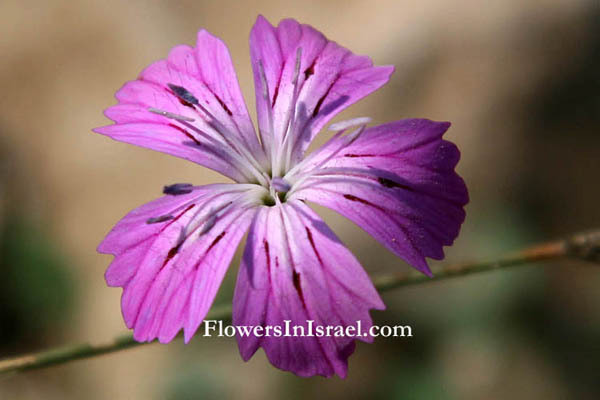 According to a Flemish custom, a variety of carnation, the pink, was worn by the bride upon the day of her wedding, and the groom was supposed to search her and find it. From this custom, the pink has become a symbol of marriage. In portrait painting, especially of the 15th and 17th cents, when held in the sitter's hand it signifies that the picture commemorates his betrothal. The carnation often appears in paintings of the Virgin Mary and Jesus, in which Mary holds a carnation out to Jesus, as in the painting by Raphael, "Madonna of the Pinks," or the painting "Madonna of the Carnation" by Albrecht Durer (1516). The pink carnation became the symbol of a mother's undying love, and in 1907 was chosen by Ann Jarvis as the emblem of Mother's Day, now observed in the United States and Canada on the second Sunday in May. A red carnation may be worn if one's mother is alive, and a white one if she has died. Location: Timna Valley, southwestern Arava/Arabah.